Ten years ago, I was a recent college graduate with an 8-month old godson, and all my Halloween excitement returned from my childhood. This adorable little guy was barely old enough to do anything exciting, but his existence itself was exciting. He would look adorable in a costume and one day procure me all the Almond Joys he could fit in his sack. I envisioned this future long before it came. It was around this time that my family began celebrating Halloween together again. A tradition was born. Each year, we’d gather with the growing troupe of tiny humans as they trick-or-treated through my aunt’s neighborhood. We’d hand out candy from the house dubbed the most entertaining door to trick-or-treat in the area, and the cackling of my mom and her two sisters could be heard from blocks away (because they set up an outdoor sound system, and someone gave them microphones. Rookie mistake). A year ago, Brian and I moved into our house one week before Halloween. It was just, you might say, our housiversary. I trekked to my aunt’s house, while Brian held down the fort, sad because I was afraid this would be my last Halloween with the kiddos. I knew with a house of our own, I’d want to decorate and revel in the joy of our Halloween space. 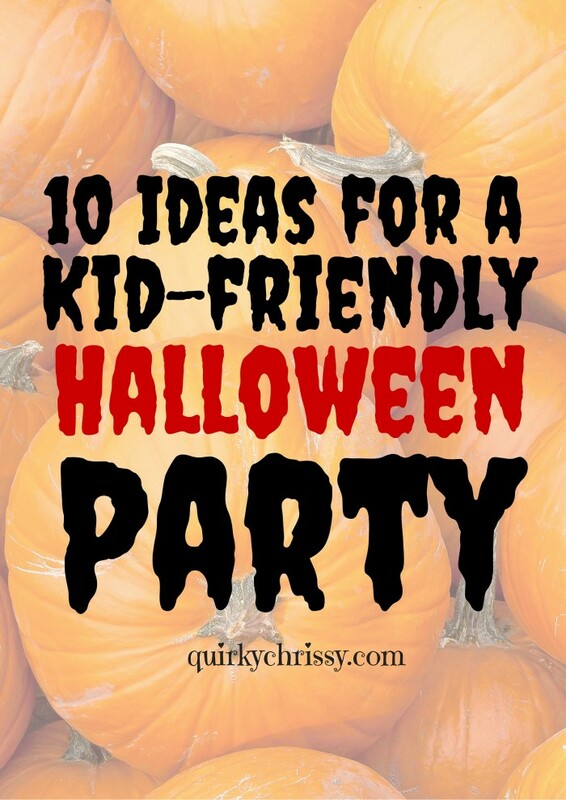 I love throwing parties and I suspected I would want to have people over for Halloween, while I handed out candy to the neighborhood kids. To my surprise and delight, my aunt informed us all that she was done hosting our family Halloween festivities. She passed me the proverbial torch without my needing to even ask! All my dreams were coming true. In just a few short days, my family will head over for a kid-friendly fiesta. Little A (who isn’t so little anymore) already knows that he’s got to find the Almond Joys for Auntie Chrissy. And I’ve got everything I need to mix the slightly scary with the bright and happy for a Halloween Spooktacular that can’t be matched! Banners and signs. 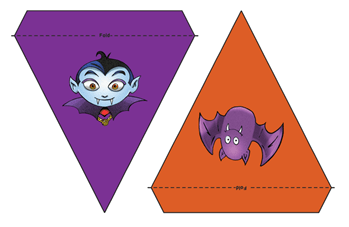 In an effort to brighten the day for some of my favorite tiny humans, Brian and I are going to add a few kid-friendly decorations to our house, like these DIY Happy Halloween flags and Lil Monster flags from Harry & David or some of the foodie signs we found at the dollar store. Previously lit candles with dripped wax. Brian and I have bleeding candles that we previously lit during a romantic candle-lit housiversary dinner in which we dined on a blanket picnic and watched several of the Harry Potter movies. 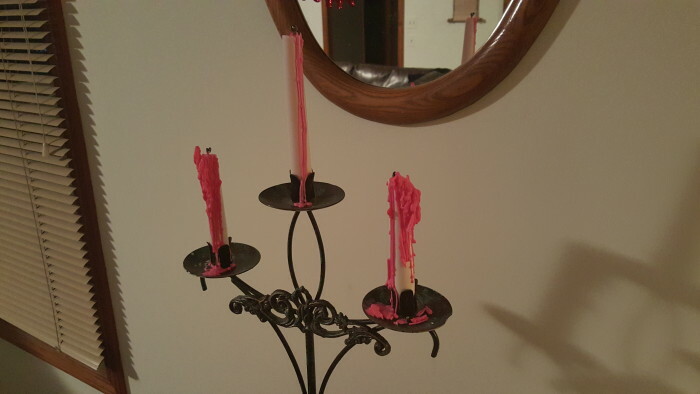 The hot pink “blood” on the candles is just creepy enough to fit our home and just bright enough not to scare anyone. Black Light Activated Chalk. In our garage, where we keep coolers of drinks, we’re going to set up an area with a black light, because we have chalk that glows in black lighting! Brian wants to write things like “Help Me!” And “Turn back!” How fun would that be? Halloween Village. 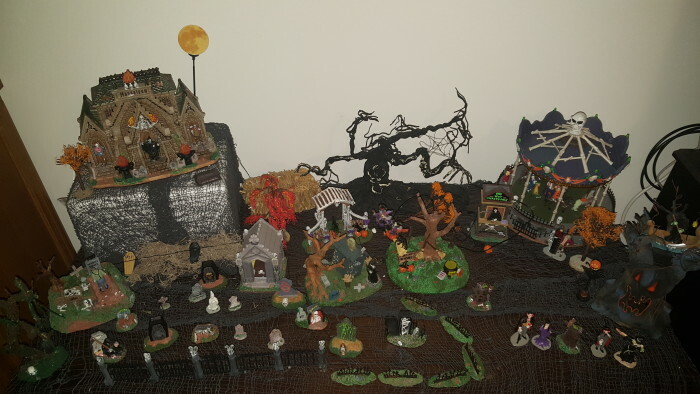 You’ve likely seen me singing about my Christmas village, but did you know I also have a Halloween village? The Lemax Spookytown collection makes my heart go pitter patter. 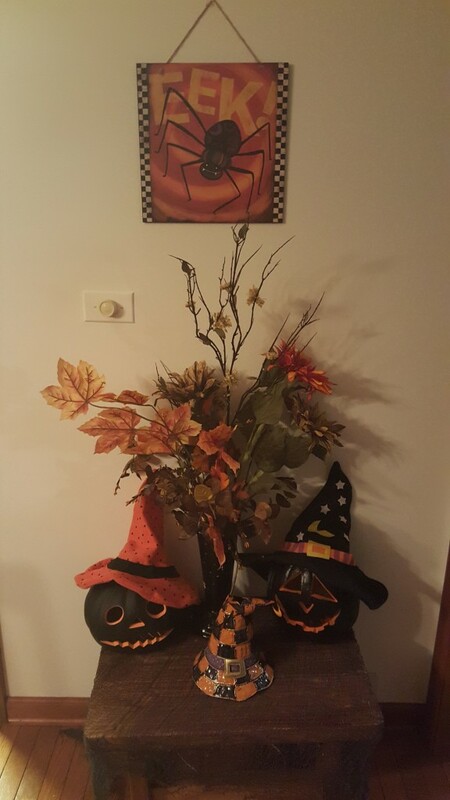 Pumpkins and witches’ hats. This is one of my favorite little spots in our house. It’s in our dining room, which I’m obsessed with perfecting, and it’s also just adorable in a light-hearted and fun way, that almost makes up for my creepy doll collection. 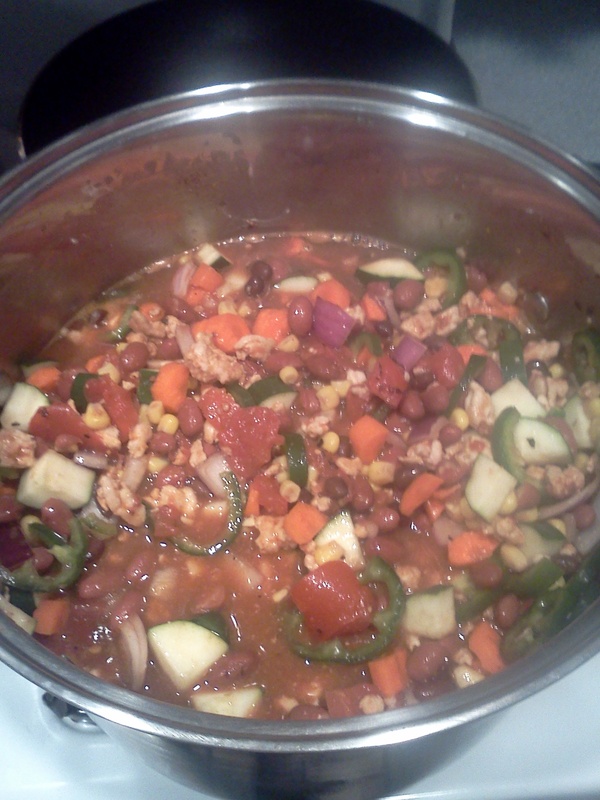 Halloween Chili. We’ll have our traditional Halloween feast of chili and hot dogs. I’ll be making my homemade turkey chili recipe and Vienna Beef hot dogs in separate Crock Pots. I may even make some fresh cornbread to go with the chili. Or pasta to make chili mac like I did a few Halloweens ago. We’ll see how ambitious I’m feeling. Puking Pumpkin. 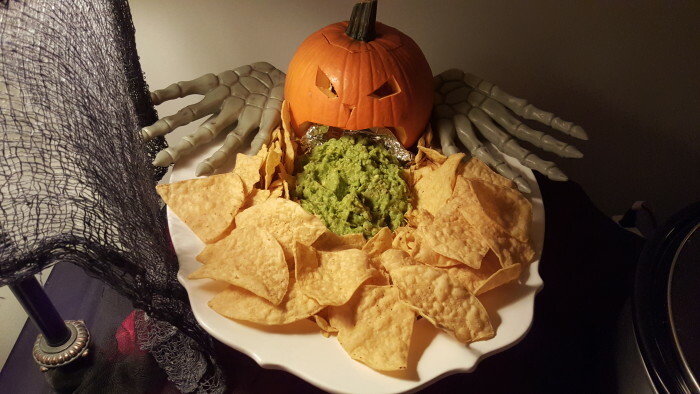 I’ll also be making the same guacamole display I created for our adult Halloween party, so it shouldn’t be difficult for Halloween proper. The kids will laugh and Brian’s homemade guacamole is the BEST. This puking pumpkin is always the hit of the party. I made homemade guac, carved a pie pumpkin, and surrounded it with chips and a pair of skeleton hands I found at the dollar store. 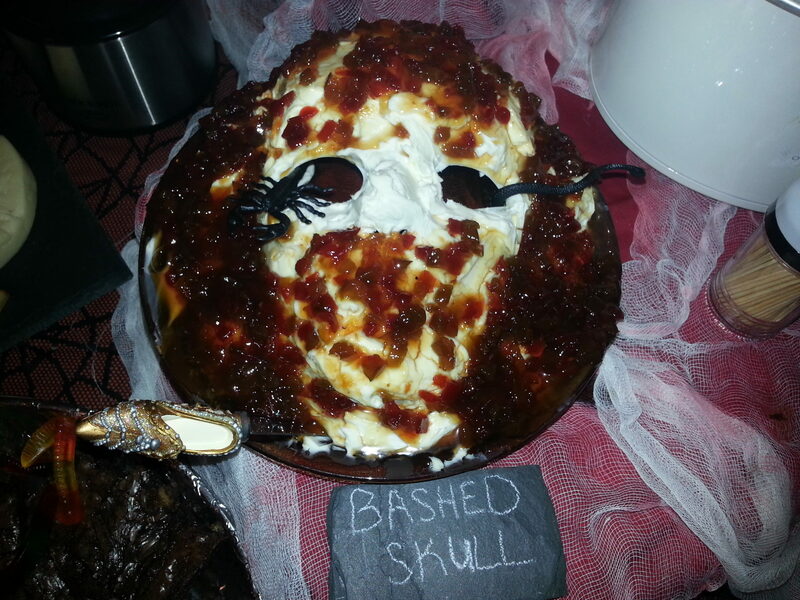 Creepy Face: I’m debating the concept of the really disgusting face I made last year for our party. It’s one of my favorite snacks, Harry & David Pepper Relish with cream cheese, but when you put it on a blank white mask, it looks…horrifying. I called it a bashed skull, though it’s less bashed, really…and more just gross face…Helena on Facebook said her kid called it a decomposing head, which was awesome. Finger cake. This was easy and fun to make. 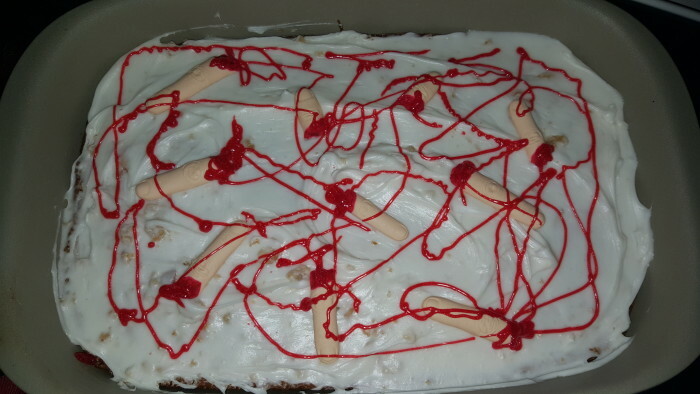 I just baked a double batch of cake in a large stone baker (because I am slightly lazy and didn’t want to like…make a layer cake or anything tricky), frosted it, and topped it with some candy fingers and gel icing decoration. Candy. OMG! These candy brains were the easiest things ever to make. 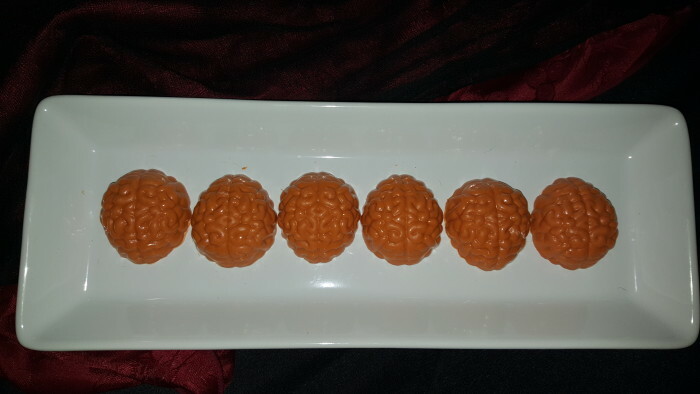 I thought I was being punny and clever making pumpkin brains with pumpkin flavored candy melts and candy molds. I recommend sticking to regular candy melts, FYI. Right now, you can enter for a chance to win a $1,000 Harry & David gift card or gourmet Harvest Truffles by playing the Spooky Treats Game. Offer & Prizes: Register for the chance to win a $1,000 HD gift card, and play the Spooky Treats Game for a chance to be one of three instant winners who will win Harvest Truffles (which are SO freakin’ delicious). There are three instant winners a day for the truffles. There is only ONE $1,000 gift card winner randomly chosen at the end of the giveaway. You can also read the Official Rules here. Follow Harry & David on Twitter, Instagram, Facebook, Pinterest, and Google Plus. This is a sponsored post on behalf of Harry & David. I was compensated to share the contest and free printables, but never to give my opinion. You get that for free, as always. Additionally, some links in this post are affiliate links and any purchases you make through my links will earn me a small commission. What decorations and food do you make for Halloween? Do you celebrate the holiday like us with family and friends? What are your Halloween plans?